I think I may be deemed officially crazy, but in September,my busiest month of the entire year, I managed to pull-off two garage sales. A girlfriend and I decided to combine our “seconds” and have a garage sale on September long weekend. We held the sale at her mother in-laws and it proved to be a great location. Our first sale did more than $500 and we were about a 65/35 split of the profits. We held the second sale this weekend, at our house and sold around $280 worth of stuff ~ not bad considering it was left-overs from the first sale. We ended the day by loading up the van and making a special delivery to a local thrift store. It feels so great to have purged crates of what I deemed to be junk and come out about $500 richer. Not bad. Many would say that garage sales are not worth the effort, but here is what I have learned. Avoid hot summer days when people are spending the day at the beach. If you opt for a summer sale, try a Thursday or Friday evening. I find spring and fall are generally better for garage sales. Consider your main objective – What is it you are seeking to do? Get rid of junk or recoup some of the money you originally put out for the item? If you are trying to sell better quality items, Kijiji might be a better option than a garage sale. People basically come expecting to pay bottom dollar. If your objective is to have the stuff gone, price to sell or post a sign saying make an offer. I generally have a few items that I am pretty firm on the price, but many I will let go for far less, just to see them gone. 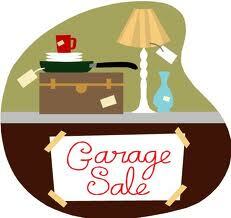 Plan ahead: I suggest starting a few Rubbermaid tubs that you constantly use for garage sale items. As clothes are out grown or items are no longer needed/used: wash them, price them and store them. If you do this as you go along, putting on a sale is really very easy. The hardest part of a sale is the cleaning and purging that is required to gather the stuff you want to sell. If you stay on top of this and continually de-clutter, you never have that huge job of going through all of your junk. I remove clothes that are too small for my kids from the clean laundry almost every week and simply transfer them to my “too small tub”. This can work for immediate donation or for a future garage sale. Decide if you want to get your kids involved or not. Our kids have sold their own toys, made crafts to sell and have also had cookie and lemonade stands. Our daughter made $25 at the last sale. This is a great way to teach them how to manage money and/or how to raise money for a great cause, if they are so inclined. Location is everything. Both of our sales were in the same general area of the city, but with completely different patrons. The first sale had clothing selling by the bag full. I am sure my friend made a few hundred on clothes alone. Clothes are not a big seller in my neighborhood, so consider your clients. Advertizing on free sites like Kijiji seems to help, as well as proper signage put up a few days in advance. I often keep the same signs and re-use them from year to year. This is especially true if you stick to the same times and don’t post the date, but the DAY(s) only. I like to make signs that stand-out and look different from the others on the boulevard. Also, make sure the printing is clear and large enough to be seen from a distance. Less print is better. Timing: For the first sale, we did a Friday and Saturday and actually did quite well on the Friday evening despite the fact we were only open 3 hours. We also had some of our Friday customers return on Saturday. Fridays are definitely worth considering. Float: I recommend a float of approximately $250 (tens, fives, toonies, loonies and quarters). Set-Up: We had a few fold-up tables, but also used make shift tables by setting planks across saw horses, crates and even 5 gallon pails. We also used large tubs and lined them end to end with items displayed on top. You really want to get the items out of the boxes and more visible. Lunch/water: It is a great idea to consider your lunch the night before, and either make a bag lunch or at least have a plan. If someone else is around to make lunch or a snack, it is not so bad, but if you’re on your own be prepared with water and food to get you through the day. If you are well prepared and organized, the work is really minimal. It took us about an hour to set-up and an hour to clean-up today. All of the items were already in tubs and priced from our last sale, so it was really a matter of setting up the tables and displaying the items. We were open from 8 to 4, so we got a good dose of vitamin D. For me, I don’t mind having a sale every year or two, but do not like to keep much of what is left-over. Sometimes, I will pass items along to someone I know or donate to a special cause, while other times I just load it up and donate it all. Once the clutter is out of my house, I do not want it back in. To me the sale is pretty much the end of the line for most items. Garage Sales are not for everyone, but for me I really don’t mind them. The best advise I can give is to plan ahead and try to hook-up with a friend or an entire street/neighborhood. It becomes more of a social event when you’re not alone, and can certainly “beef-up” your traffic when there are mulitple families participating. I actually enjoyed both of the sales and was thankful for the opportunity to visit with a friend that I don’t see nearly enough of! Posted on September 22, 2013 by Cindy Roy •	This entry was posted in Family, Organization and tagged garage sale planning, garage sale tips, garage sales, how to plan a garage sale. Bookmark the permalink.